It’s been about 5 months since I last gave a Review Board status update. Way too long, given how much has changed. So once again, let’s start off with a few stats. Review Board has matured in recent months and has a very nice feature set. More and more we’re seeing and hearing about companies using it in one or more teams. I was even lucky enough to talk about it in the official Django Book . Development shows no sign of stalling. Our feature request list is a mile long, and our personal TODO lists are longer still. We’ve implemented so many new features and fixed so many bugs that I can’t even list them all, but let’s take a look at the highlights. iPhone support. Basic read-only iPhone support was added. It’s more of a proof of concept and to make sure our codebase handles different UIs on top of it, but if your Review Board server is accessible from your iPhone, point Safari to /iphone/ for some fun. Status Reports. Basic support for status reports have been added. While we don’t have a fleshed out UI in place, the /reports/ URL will give you simple reports showing which review requests you’ve reviewed, and other bits of information. This can even be presented in Wiki format! Mercurial support. One of our contributors has written support for doing review requests against Mercurial repositories. This supports local and remote repositories. Git support. Basic Git support was written as well. It only works with local Git repositories (as it has to have access to .git directories). Improved diff parser. We no longer require third party tools in order to parse diff files. We can do it ourselves faster and with greater flexibility. This has given us some speed advantages, reduced the hacks needed, and improved diff compatibility. Interdiffs. Review Board can now display the differences between two revisions of a diff. This makes it much easier to review several iterations of large changes spanning many files. Fixed diff line numbers. Line numbers in the diff viewer used to be artificial. They were essentially table row numbers. Now line numbers on the left-hand side of the diff viewer represent the actual line numbers in the original file, and line numbers on the right represent the new file. “Review” link. Added a “Review” link on the diff viewer and screenshot page for bringing up the Review dialog. Previously users had to click a link on the diff viewer regardless of whether they were leaving a comment on the diff. Show commented screenshots on reviews. Portions of a screenshot that the user has commented on will appear in the review body, much like diff fragments do. This greatly improves the review process when it comes to screenshots. Updated diffs create a new draft. Newly updated diffs used to instantly appear and send out an e-mail, which was annoying if you realized you needed to change and re-upload the diff again. Now updating the diff just creates a draft, if one doesn’t already exist. The diff won’t show up or spam users until you’re ready for it to. Auto-completion for reviewers. The reviewer lists now have support for auto-completion of group names and usernames. As you’re typing, a list of choices based on the current text will appear. Navigating with the arrow keys or hitting Tab will auto-complete the selected entry. Default reviewers. Administrators can now specify default reviewers for file paths (as defined by a regular expression). This allows certain groups to “own” files or paths and to be included on the reviewers list any time a diff touching those is uploaded. Improved page banners. The draft banner at the top of the review request page has been improved and is now more clear. No longer do you have to save a draft and then publish it. It’s now one single button on the banner. We also added “discarded” and “submitted” banners. Alpha-numeric bug numbers. Not all bug trackers use numeric-only bug identifiers. We now support alpha-numeric bug numbers. Starred review requests and groups. Users can now “star” a review request they wish to keep track of in their dashboard. They’ll be placed on the CC list and see changes in the dashboard. Users can also star a group in order to add it to their “Watched Groups” list in the dashboard. Toggle display of submitted review requests. The “All Review Requests” page can now filter out submitted review requests via a toggleable “Show/Hide Review Requests” link. Customizable columns. The various lists pages and the dashboard now support customizable columns. There are non-default columns that can be added to the view to show extra data, and existing columns can be removed. If you prefer all dates to be relative or absolute, just add the right columns. Furthermore, columns can be reordered simply by dragging them into the desired order. New Updates. 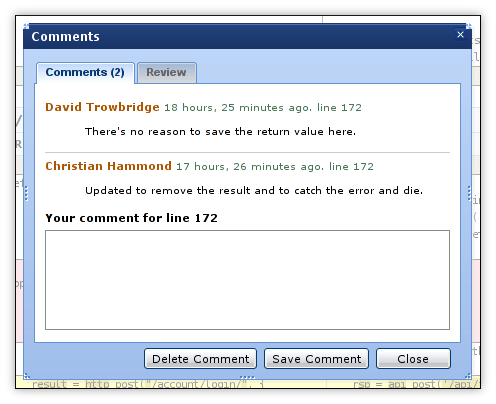 This column shows a speech bubble icon when new discussions have taken place on a review request since the user last visited it. Absolute/relative timestamps. Users wishing to see only relative or absolute timestamps in the dashboard can add the Last Updated/Posted Absolute or Relative timestamp columns. Number of Reviews. Sometimes it’s handy to see how many reviews have been made to a review request. This column provides that number. Starred. Allows users to star/unstar a review request or group. This is like adding yourself to a CC list. Upload diffs from a revision range. --revision-range has been added to allow for uploading diffs from a range of revisions on the server. This is currently only implemented for SVN. Specify a default summary. --summary has been added to provide a default summary for the review request. Open a browser after uploading. --open has been added to open a browser to the new review request. make install. It’s now trivial to create a Review Board tarball or to install it on your system. We integrate with autoconf/automake to generate the Makefiles and sample/default configuration files. This brings us a giant step closer to putting out releases. We have several things in the works. A couple of the major highlights would be a search interface and support for 3rd party extensions to Review Board. Stay tuned! It’s been just over a month since the last Review Board status update. I thought this time I’d start off with a few stats. If you’re part of an open source project or company using Review Board, we’d love to hear from you and your experience. We’d like to make a list of who’s using Review Board, so if you’re able to list your project/company, please let us know! Now on to the feature updates. Internet Explorer compatibility. Internet Explorer should now work properly with Review Board. A lot of work was recently done to make this happen and it hasn’t been as extensively tested as we’d like just yet, but things do appear to be working. Firefox is still the preferred (and targetted) browser, but do feel free to try IE and let us know if anything breaks. CVS support. 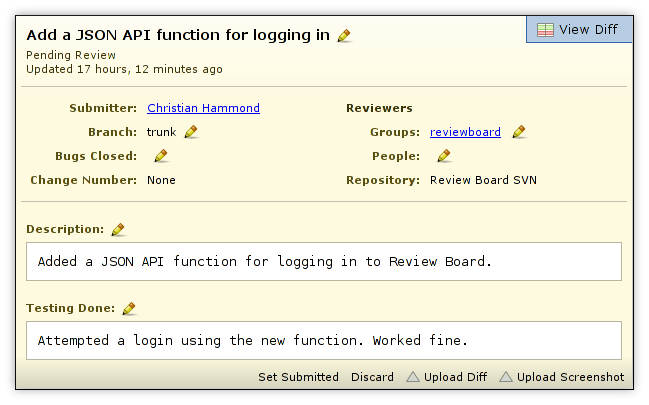 Review Board now supports CVS repositories. Right now there’s only :pserver support, though, but patches are welcome. Improved post-review script. post-review, the script of choice for creating and updating review requests from the command line, now supports both Perforce and Subversion, with support for more systems on the way. A single post-review script can now handle a variety of repositories for different projects, and projects can be set up to point post-review to the right Review Board server. Column sorting and list paging. Columns in the dashboard and review request lists can now be sorted by summary, submitter, posted time or last updated time. There’s also an improved pager at the bottom for skipping to other pages in the list. Collapsed diff sections can now be expanded. The brown “n lines hidden” boxes in the diff viewer can be individually expanded without reloading the page by clicking a little “Expand” link on the box. This makes it easy to get more context when needed without expanding the entire diff and having to reload the page. Cross-platform CRLF support. Diffs generated on Windows will now apply correctly on Review Board instances running on Linux, and vice-versa. Improved diff loading times. Large diffs take a while to load, but we’ve improved this slightly by caching much of the resulting diff so that it doesn’t have to be regenerated again. More work is planned in this area to improve loading times, but it’s a lot more usable now. More reliable database migration. The database migration scripts didn’t scale very well due to the existing Django libraries we were making use of being problematic for large database sizes. We’ve now fixed this, and they should be more reliable and hopefully a bit faster as well. There’s now a percentage complete indicator when loading back in. Anonymous access to Review Board. It’s no longer necessary to have an account in order to view review requests and diffs. This is desirable for most open source projects. The old behavior of requiring an account for site-wide access can still be enabled, but is disabled by default. In the works is a much improved diff parser that won’t require lsdiff on the server hosting Review Board. This should make things a little easier for people installing on Windows, and it also cleans up the code quite nicely. This should be in sometime this week.